1) The Malecon, a wide sidewalk on the waterfront, with beaches, sculptures, tourist pier, marinas, hotels, restaurants and unimpeded sunsets. 3) The Espiritu Santu island group, a Unesco World Heritage Site, is about 3 miles off the coast of La Paz that offers world class kayaking, snorkeling, diving, a variety of marine life to view such as sea lion colonies, in addition to, unique flora and fauna. It is also home to Ensenada Grande considered to be one of most beautiful beaches in the world. 4) La Ventana, another beach close to La Paz on the sea of cortez, offers world class kiteboarding, windsurfing and international tournament events. 5) The Balandra and Tecolote Beaches are about 15 miles from La Paz and are only separated by a protected area consisting of small mountains, sand dunes, mangroves and lagoons. Balandra has clear, calm and shallow water ideal for snorkeling and kayaking. It is also considered to be the best beach in La Paz. Next door, Tecolote Beach features camping, restaurants, tiki bar and beach rental gear. Lake Potrerillos, a one hour drive from Mendoza, is ideal for outdoor adventure sports. Mendoza is a semi-arid mountainous environment, furrowed with rivers that carry melted snow water from the Andes into an extensive system of irrigation canals that have turned the area into a productive oasis specifically fit for vine growing and Eco-tourism. This system of rivers and irrigation canals also support the life of over 100,000 trees that provides a canopy over most of Mendoza city. These sources of water have also been used to create several artificial lakes such as the one found in Mendoza’s San Martin Park which is host to a variety of nautical competitions like sculling and jet ski races, as well as, Lake Portrerillos that features pristine water for kayaking, fishing, rafting and swimming. For the purposes of eco-tourism the province of Mendoza can be divided into four areas which are the northern oasis, southern oasis, central oasis and southern border oasis. All the photos in this essay are made in the northern oasis which stretches from the capital city of Mendoza to the northern border of Chile. This is the hill of seven colores about 4 miles from Uspallata, The colors are attributable to different types of rock that came together over a long period of time. As the road leaves the oasis of Uspallata it enters a desert environment much like this until it reaches the hill of 7 colores. Along the road to the hill of 7 colors there are many interesting geological shapes and figures of different colors. The oasis of Uspallata, a small village at an altitude of 6000 feet offers a variety of outdoor recreational activities and 2 distinct eco-systems. During the fall season, Uspallata is a good place for mountain biking and scenic landscapes. In the foothills of Mendoza there are the Cachueta hot water springs about an hour’s drive from Mendoza.Here, you will find both an upper level of pools as well as the lower level in this photo. This is the upper level of pools at the Cachueta Hot springs and the water temperature of each pool varies. The Rio Pichueta In the Andes along with this bridge is a historical site where General San Martin’s armies crossed the border into Chile and launched an invasion to liberate the country from Spanish rulers. This river is also a good place for trout fishing. The lake in San Martin Park is host to a variety of nautical events like sculling. It is one of several man made lakes in Mendoza. Located in the southern zone of Chile, Pucon is one of the most popular eco-tourist destinations in the country. The main attractions include volcanos, caves, lakes, rivers, national parks, natural hot springs, waterfalls, beaches, stable climate, and pristine natural enviroment. A few of the related recreational activities consist of trekking, mountain biking, white water rafting, kayaking, fishing, sailing, horseback riding, zip line canopy tours, guided accents of the Villiarica Volcano, snow skiing in winter, water skiing in summer and bird watching,. If that’s not enough, Pucon has arguably the best small town infrastructure in South America. This means quality accommodations and good restaurants offering a variety of international cuisine. If your the type that would rather prepare your own meals, there are at also 3 large supermarkets in this village of 20,000 people that you normally do not see in cities with less than 500,000 people. Last but not least, if you prefer greenbacks instead of trees, there is also a casino with 488 gaming machines and 44 table games. All things considered, there are few eco-tourist destinations that have this much variety to offer their guest. Mendoza is a city in western Argentina in the foothills of the Andes and Cuyo desert region. It is both an emerging ecotourism destination and the largest wine producing area in Latin America for which it is world-renowned. Although it is has an arid and desert like climate, , Mendoza has used a simple flood irrigation technique for centuries that has only required a few extensions and minor modifications over the years to provide enough water for the growth of over 100,000 trees that line every street, a variety of urban green spaces, as well as the growth of grapes used to make its wines. This system consists of irrigation channels in all the streets with flood gates to control the distribution of water diverted from the surrounding rivers and mountains as needed. Starting with bike wine tasting tours to local vineyards, there are quite a variety of outdoor activities for eco-tourist to enjoy in Mendoza. When in the city itself, perhaps the best place to visit would be the 971 acre Parque General San Martin. It consist of tree-lined hiking and biking trails, gardens, a lake with regatta’s for sculling boats, fields with outdoor exercise equipment, a zoological park, soccer (football) stadium, playgrounds, equestrian center, tennis club and an amphitheater where the international wine festival is held annually. A few of the other natural attractions to visit in the Mendoza area include tours to Mount Aconcagua the highest peak in the western at 22,000 feet, Atuel Canyon where there is an oasis that is over 100 feet deep, the hot springs of Cacheuta. and Luna valley ( moon valley) where there are many mystic geological formations. At these and other locations nearby you will find many outdoor adventure activities such as white water rafting, mountain biking, trekking, horseback riding, rock climbing, canopy zip lines, hang gliding and kayaking. Malecon 2000 is an urban renewal project that combines a commercial shopping center, an historic area, botanical gardens and museums. It was completed in year 2000 and is a 1.5 mile long promenade on the banks of the Rio Guayas that has 3 distinct sections. The commercial center has some 230 stores which are found underneath the promenade while a variety of restaurants, bars and cafes are above the retail stores overlooking the river. There are also several boarding docks in this area where embarkations offer both day and nighttime cruises up and down the river Guayas. The historic civil plaza located in the middle of the promendade has a number of monuments created in honor of important persons in Ecuador’s past, as well as some recreational areas for children. On the other side of the historic area are the malecon gardens that occupy about 22,000 sq. meters as well as several museums. In these gardens there are pedestrian pathways supplemented by a variety of native flora, ponds, lagoons, streams, fountains and bridges.. Other nearby attractions for the eco-tourist include an iguana park, the Cierra Blanco Forest Reserve and the Machalilla National Park. Due to its natural beauty, spring like climate year around and many outdoor adventure sports; Banos is one of Ecuadors most popular tourist attractions. At 5,900 feet in the Andes mountains this small village has international appeal and is surrounded by 60 waterfalls, deep river gorges, steep bluffs, lush green mountains, expansive plateaus, and hot springs heated by the nearby Tungurahua Volcano.The list of outdoor adventure activities includes white water rafting, kayaking, bungee jumping, mountain biking, horseback riding, amazon jungle tours, waterfall tours, zip lines, atv trails, cable car rides, canopy tours, trout fishing, rock climbing, mountain climbing, trekking and most anything else you could want at an eco-tourist resort. In addition to these outdoor adventure activities, Banos also has many festivals, special events and parades. So the mood in town is usually festive and upbeat. There are also quite a few good restaurants with international cuisine from around the world at very reasonable prices. I recall seeing German, Italian, Danish, Chinese, Mexican, Uruguayan, and Japanese restaurants, as well as a variety of pizzeria’s. If restaurants are not what your looking for at the end of the day, you can also find a bar zone with a variety of nightclubs. the virgin waterfalls at the edge of town with thermal baths next door. Zip line over the manto de la novia waterfalls. Its your choice of head first or feet first. street performers from argentina demonstrating folk dances of their homeland. Over 100 feet tall, the Pailon del Diablo waterfall also has one of the worlds scariest staircases. This photo shows the bottom half. The Cajas National Park is located about 45 minutes away from Cuenca, Ecuador by car or bus at an altitude that ranges from 10,000 feet to over 12000 feet. At the entrance to the park there is a restaurant, trail maps, lake, restaurant and exhibits. The main trail from the vistors center is about 4 km in length with moderate to steep elevation gains along the way. It can take approximately 4 to 5 hours to finish hiking this trail depending on weather and individual hiking capabilities. This trail includes several different lakes, rivers, lagoons, fishing opportunities, bird watching, inca ruins, camping, and a variety of flora. All the photos seen in this gallery are part of the main trail which starts at the park entrance. Mexico is one of the top 5 countries in the world in terms of ecological diversity and is home to the Paricutin Volcano that is also one of the 7 natural wonders of the world. This is the result of Mexico’s topography which varies significantly and its geographic situation which places it between distinct eco-zones. There are many ways to enjoy these natural wonders found in Mexico including white water rafting, scuba diving, sailing, trekking, mountain climbing, bird watching, biking and a variety of other eco-activities. Naturally, there is some disagreement about which of mexico’s natural wonders are the best, so researchers have conducted surveys to determine which of these is most popular. 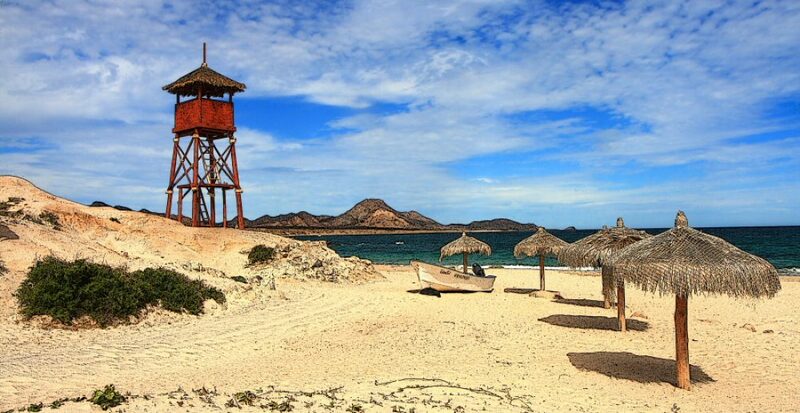 Copper canyon was determined to be the most popular followed by Sumidero Canyon, the butterfly reserves and the meso american barrier reef..
El Requeson beach is found in the bay of concepcion and is part of the sea of cortez. Great location for camping, kayaking and snorkeling. Sumidero Canon is one of the most popular natural wonders in mexico and was carved out by the Grijala River seen here. In some places the ealls are as high as 1000 ft and its 13 kilometers long. There are thirteen rapids, 5 waterfalls, 3 beaches and 2 freshwater springs. Blue Agave plants in the State of Jalisco. A cultivated eco-system and UNESCO World Heritage Site. Akumel, Maya Riviera, the meso american reef system is a short swim for this lagoon. Cooper Canyon has 6 distinct canyons in the Sierra Madres. It is larger and deeper than the grand canyon of Arizona. Sian Ka’an, entrance to the primary mangrove chanel leading into one of the worlds unesco natural heritage sites. Tapalpa is a rustic mountain village surrounded by pine forest at an altitude of approximately 6800 feet and it is a popular weekend resort for nature lovers in the Guadalaja area. It is also one of Mexico’s pueblo magico’s and offers the eco-tourist a variety of outdoor activities. What attracts eco tourist to this village are several extreme outdoor adventure parks including the Bosque La Mexicana, Eko Park, Parque Natural Los Frailes and Parque Aventuras la Ceja and Monte Real Adventura. These parks feature zip line canopy tours, rappelling, rock climbing, atv trails, mountain biking, hang gliding, trekking and obstacle courses. One of the favorite attractions for the extreme adventure lover is the Canopy Tour at Eko-Park. This is a circuit consisting of 9 zip lines more than 25 meters off the ground where the longest is 300 meters and you can reach speeds of 50 kilometers per hour.For the less adventurous, there are scenic hiking trails to both springs and waterfalls such as Salto del Nogal which is the highest waterfall in the state of Jalisco at just over 100 feet. In keeping with the spirit of outdoor living, you will also find many good restaurants around the village that specialize in outdoor grilling of fresh meats. Bon appetite.. Here are two of Tapalpa’s landmarks. On the right is the old Templo San Antonio, now a musuem of religious art and the new templo San Antonio in the background. The village of Patzcuaro is found in central Mexico at 7200 ft. above sea level and is one of the countries Pueblo Magico’s because of its 16th century atmosphere. In addition to the town of Patzcuaro, the lake is surrounded with small villages, artisans. lush green landscapes, pine forest and wetlands. There are also 6 islands to explore in Lake Patzcuaro, the most popular being Janitzio. It has tourist facilities and is famous for its day of the dead festivities which begin with a candlelit boat procession from the mainland to the island and ends at the Janitzio Church graveyard with an all night candlelit graveside vigil. At the islands highest point there is also a 40 meter statute of Jose Morales, a hero of Mexico’s independance. Inside this statue, one can climb a spiral staircase to the top where there are great views of the surroundings while the interior walls of the staircase have murals depicting the life of Jose Morales. The area of Lake Patzcuaro also offers the eco-tourist many outdoor activities such as hiking trails in the forest of El Malpais de Arocutin, birding, horseback riding, mountain biking and such nearby attractions as the El Rosario Monarch Butterfly Reserve and the National Park in Uruapan. The latter is Mexico’s only national park found within the limits of a city, It is famous for the beauty of its flora and the crystal clear water of the Cupatitzio river with its cascading waterfalls as seen in the photo gallery below. The Gardens of Lake Atitlan are about a 3 hour drive from the border of Mexico by shuttle bus. Altogether, there are said to be over 500 species representing some 250 plant families found in the separate and distinct gardens that surround the upscale Hotel Atitlan. The antique, modern and David Austin rose gardens, for example, have over 200 varieties of roses on display. In other theme gardens there are over 50 varieties of hibiscus, arbors of vine, 25 or more colors of bougainvillas and azaleas, along with a variety of orchids to be seen. Other theme gardens include the wedding gardens, the coffee gardens, the helicona gardens, and english style knot gardens. The small sample of images in the gallery below is representative of what you can expect to see if you visit the Atitlan gardens. The La Pila Fountain landmark was constructed in1592 with a diamond shaped Moorish design made of brick. Chiapa de Corzo was once the capital of the state and is now one of Mexico’s Pueblo Magico’s due to it’s historical significance. It is located between San Cristobal de Las Casas and Tuxtla Gutierrez on the banks of the Grijalua river. The main tourist attractions here include some impressive church architecture, sumidero canyon and ecological park, waterfront restaurants on the river and the waterfalls of Chorreadero Park. Touring Sumidero Canyon requires an inexpensive 2 hour boat ride that cruises down the Grijalua river through steep vertical walls that rise up as high as 1000 meters in some places while the park offers hiking, cycling, rappelling, rock climbing and kayaking recreational activities. The Chorreadero waterfalls and ecological park is only a 15 minute ride by taxi or car from Chiapa or the waterfront. The main attraction here is a stream that emerges from a cave which is the end of an underground river and plunges like a waterfall from a height of about 25 meters to form a series of cascading pools for swimmers to enjoy. The caves and underground river can also be explored by arranging a guided tour. Take the guided photo tour for more information about these attractions. This botanical garden is only 3km from the center of town and should be on everyone’s to do list when visiting San Cristobal. It consist of a 1700 meter guided nature trail, an orchid greenhouse with another currently under construction, a botanical garden with a variety of flora native to the state of Chiapas, a spring fed lagoon, small amphtteather, as well as guided tours with educational activities. In general, the mission of Moviquil is to rescue, maintain and preserve a variety of flora native to the state of Chiapas for the benefit of future generations. So far, the Moxviquil group has rescued over 3,000 plants representing over 418 species of the 700 recorded for the state of Chiapas. For more information, check out the Moxviquil website at http://www.orchidsmexico.com and the photo gallery below. these are called air plants or technically epiphytes because they do not root in soil but grow on the branches or trunks of other plants. another example of an airplant in the garden. the most common types are orchids, ferns and bromeliads.